This afternoon I visited the witchcraft exhibition that's on in Brighton at the moment and I bumped into a famous druid - Philip Carr-Gomm. 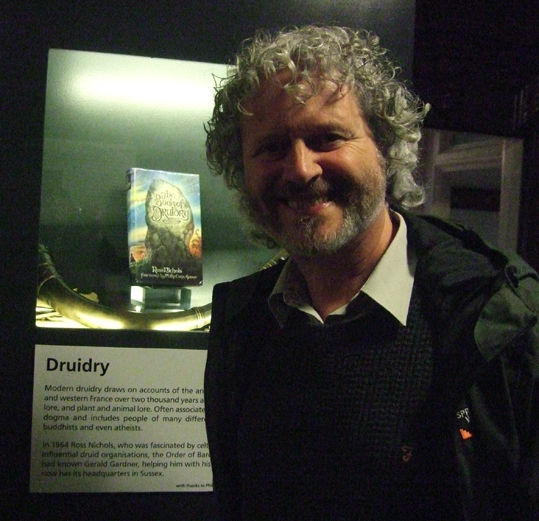 He kindly let me take his photograph in front of the some druidic items on show there. The full title of the exhibition is: Folklore, Magic and Mysteries: Modern Witchcraft and Folk Culture in Britain and it has displays of artefacts, manuscripts and documents from the Doreen Valiente Foundation collection. I'll be posting more about my visit on my blog when I've had a chance to sort out the rest of my photos and write some more about them.